Owing to our vast industry experience, we are able to offer a superior quality range of Soxhlet extraction mantles. To ensure ease of operation, we offer these mantles with rectangular box housing the heaters and built-in controls. With the help of flexible and elastic heating element, these mantles ensure uniform distribution of heat through close contact with the flask. Choice Of 3, 4 Or 6 Flasks With Switch Or Energy Regulator. M.s Body With Powder Coating Max Surface Temp 350 Deg C.
- Choice of 3, 4 or 6 flasks with switch or energy regulator. - M.S. body with powder coating maximum surface temp. 350 degree C.
- The complete Soxhlet Extraction Apparatus consists of solvent reservoir extraction assembly with 3, 4 & 6 extraction heaters of various diameters to suit 250 Ml flasks to 1 ltr Ml flasks. - Outer casing is made of CRCA Steel - finished with powder coated paint. In order to keep pace with the requirements of the clients, we are offering Soxhlet Extraction Mantle. Soxhlet Extraction Mantle is widely used in microbiological laboratory for incubations. It keeps the water at a constant temperature. Besides, these products are known for its durability. 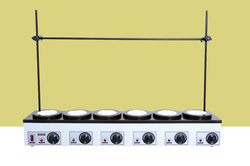 This apparatus is suitable to heat soxhlet flask of different sizes. It is made up of thick gauge fresh c.r.c.a. sheets, chemically treated to remove all oil, grease etc. It is painted with primer followed by two coats of duco automotive paints.